© 2011 Michael Bonin and Associates. All rights reserved. This exceptional music broadcast features a medley of two jazz classics: ‘Angel Eyes’ composed by Matt Dennis and Earl Brent in 1946 and ‘Blue Bossa’ composed by Kenny Dorham in 1961. It is from the 2010 album NO MORE BLUES FROM THIS MOMENT ON released by Michel Bonin at the piano solo and keyboard, part of LE MUST collection of a series if one is looking for a serene blend of the genres: the Great American Song Book, instrumental jazz and French chanson. Go to www.michelbonin.com for more information and to purchase online the digital version of the whole album (in better MP3 format), individual tracks or the CD in hi-fi quality. This episode is the latin dance version of <Chega de Saudade (No More Blues)> recorded by Michel Bonin on piano and keyboard with guitar, voices and a rythm section. Composed by Antonio Carlos Jobim, it is Track #15 of the album titled NO MORE BLUES FROM THIS MOMENT ON released in 2010. Look for other episodes scheduled to be released in MP4 - Enhanced Audio (iPod compliant). For a limited time, one can subscribe for free to this podcast. 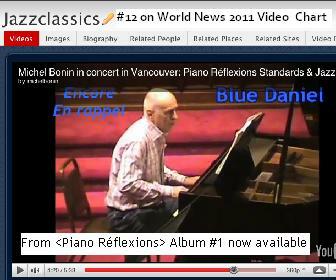 Go to www.michelbonin.com for more information on the series Piano Réflexions - Standards and Jazz Classics - Musique d'ambiance and about its publisher MICHAEL BONIN AND ASSOCIATES. The CD (Album #1) with the complete liner notes can be purchased at $14.95 CAD (plus $5.00 CAD handling charge when ordered online and mailed/shipped by regular post). Or order online the digital version of the album for only $9.95 CAD or individual tracks (#1 to #15) for $0.99, as of 2011. For each digital audio product ordered, the buyer receives an e-mail with a url link to safely download it in better mp3 format (192 kbps). One may share the same download with friends but episodes or actual tracks should NOT be broadcast (including on digital radio) or uploaded on the web including on social media, without written permission from the publisher, the tunes being copyrighted. Comments/reviews can be posted on Facebook, LinkedIn and others including Twitter where one can follow Michel Bonin @pianoreflexions. To contact him personnally or to order online, visit www.michelbonin.com. Listeners and viewers are also invited to post comments, suggestions, etc. in the guest book hosted on the website. © 2013 MBA - Michael Bonin Associates. All rights reserved.